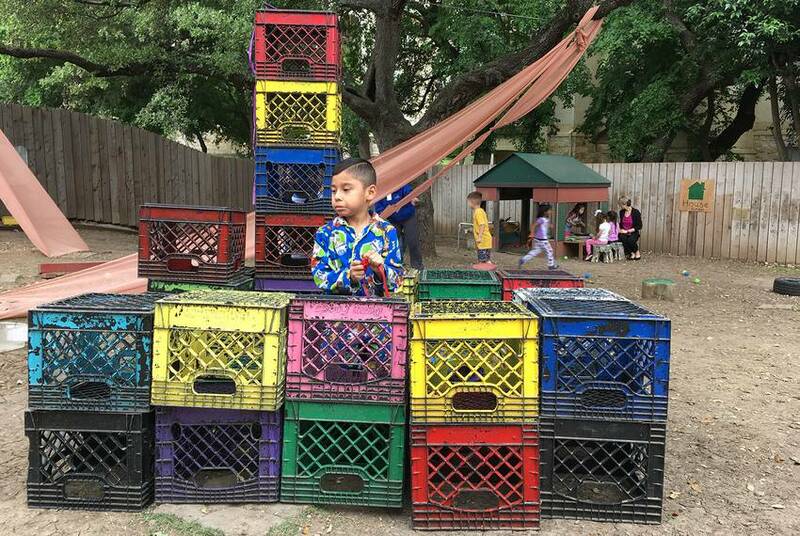 SAN ANTONIO — By the end of the school year, the playground at Pre-K 4 SA North Education Center looked like a dreamscape of “DIY Outdoor Learning Spaces.” The playground was divided into a series of yards, separated by gates, each with its own cozy reading nook and a music station equipped with unconventional instruments. Some yards featured kid-size building materials. On a late spring day, the most popular elements — based on the scrum of kids around them — were those that allowed kids to delve deeply into their imaginations: a stage, a whimsical fishing pond full of random objects and a cardboard boat. The teachers on these playgrounds were in the middle of the action, playing alongside the kids. One teacher, surrounded by pint-size fellow actors, took a bow on the stage. Another challenged an eager student to a building contest at a Lego table. The playground is part of a deliberate approach to early learning designed by San Antonio's city-funded pre-K initiative, Pre-K 4 SA. Since 2013, the program has served almost 8,000 students in its four education centers and awarded $8.5 million in grants to other pre-K centers and school districts around the city. Although parents praise it, the program has also had to contend with constant scrutiny from district superintendents and conservative politicians, including some who have indicated they will use the third-grade test scores of Pre-K 4 SA’s inaugural class of 750 students — whether the scores are above or below the district average — to campaign against the program. The City Council, largely supportive of Pre-K 4 SA, will decide whether the program’s continuation will make it onto the 2020 ballot. The point of the public program, as it was presented to voters in 2012, is to boost long-term educational outcomes and eventually improve the citywide workforce. While critics question whether the Pre-K 4 SA initiative accomplishes that goal, few question the quality of the education children receive at the four centers. 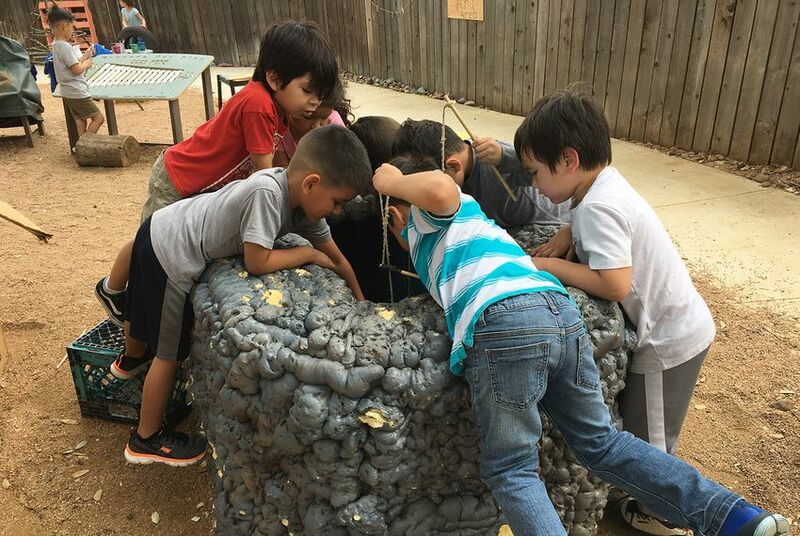 Pre-K 4 SA uses a research-based curriculum called High Scope, which stresses a hands-on approach to developing memory, creativity, problem solving and self-control. When they aren’t outside, children at the four Pre-K 4 SA centers spend their days in meticulously appointed classrooms. They grow food for their lunches in school gardens, and they spend several weeks in an outdoor classroom, a covered porch with a full classroom underneath. The program’s CEO, Sarah Baray, says the approach makes a big difference. Baray, a former teacher and principal in Austin schools, has also taught at Texas State University, where she conducted extensive research on educational leadership, community involvement and school improvement. She said she sees clear evidence, as do others in her field, that developing those skills helps students persevere, work with others and think critically. “It’s like embedding your educational foundation in the bedrock,” she said. Students who qualify for pre-K in their home district pay no tuition to enroll in Pre-K 4 SA. In 2016-17, 1,311 of the program’s 2,060 students qualified for free tuition because of their family income or their status as English language learners or as children of military parents. Others who qualify are in foster care or homeless. Families who do not qualify for free pre-K can pay tuition on a sliding scale to ensure that it is affordable and available for everyone. For example, a family of four making $50,000 per year pays $1,000 per year per student. Ten percent of Pre-K 4 SA spots are reserved for tuition-paying families. Parents say the instruction at Pre-K 4 SA is as good as any they’ve seen at private schools. If Pre-K 4 SA hadn’t been available, said Denise Ojeda, “I would not have been able to send my son to a school like this.” Ojeda, who works for financial services provider USAA, said she paid some tuition. Although she couldn’t remember the exact amount, she said it was much less than private full-day preschools, most of which cost around $750 per month in San Antonio. Ojeda’s son Cristóbal, now 9, was the first student to walk through the doors at the Pre-K 4 SA South Education Center five years ago. He is still enthusiastic about it, she said. “Pre-K 4 SA definitely is focused on the success of its students, but also extending that arm to the families that need it,” she said. Although Pre-K 4 SA offers some transportation using specialized 15-passenger vans outfitted for 4-year-olds, Rishell drove 45 minutes across the city to take her son to the South Education Center after he was waitlisted at two other locations. “I don’t regret it at all,” she said. She even made additional trips regularly to volunteer. “There’s always something going on up there,” Rishell said. The program will need that support — and more — in 2020 when San Antonians will vote on whether to continue funding it. Pre-K 4 SA is funded through a one-eighth-cent city sales tax that generates around $35 million per year. The program currently reports spending about $11,500 per year per student, along with about $4.2 million annually in grants to other pre-K providers and school districts to help expand full day pre-K and teacher certification. The program also spends over $2 million per year on professional development and coaching, which it makes available to any pre-K through third grade teacher in San Antonio. Former Mayor Julián Castro placed the initiative on the November 2012 ballot, where it passed with 54 percent of the vote. The first two centers opened in 2013 with 750 students between them. Now at full capacity, four centers serve a total of approximately 2,000. The per-student spending is high for Texas, which spends between $9,000 and $10,500 (depending on who is doing the calculating) on average per K-12 student, but only around $3,800 per preschooler. Pre-K 4 SA spends what it needs to offer an excellent education, Baray says. “We’re staying true to what we know in the research works and what has long-term benefits,” she said. Pre-K advocates across the state are also aware of those benefits. The advocates, who recently testified in Austin before the Texas Commission on Public School Finance to make their case for more pre-K funding, came armed with copious data showing that kids who start early see immediate and lasting benefits. The city of San Antonio contracts with professional research corporation Westat to evaluate students’ kindergarten readiness at Pre-K 4 SA. These internal audits show that children who came to Pre-K 4 SA significantly behind in cognitive, literacy and math skills have become more prepared for kindergarten; and the level of preparation has increased in each of the four years the program has been in operation. As measured by the Teaching Strategies GOLD assessment, a tool that uses classroom observation to evaluate teaching and learning, Pre-K 4 SA consistently delivers students to kindergarten ahead of the national average. However, many Pre-K 4 SA graduates go on to attend chronically low-performing schools, which makes it harder to sustain the benefits imparted at Pre-K 4 SA. That’s why the program was designed to offer professional development to kindergarten and elementary school teachers in San Antonio’s 19 public school districts. “We do know that what happens after they leave us matters,” Baray said. “If a child has high-quality K-3, they are almost indestructible academically,” she said. The program’s first 750 alumni took the state’s third-grade reading test this year. The scores on this test are a benchmark of Pre-K 4 SA’s success, as laid out by the taskforce that designed the preschool initiative. In theory, these scores will demonstrate whether Pre-K 4 SA is really performing better than pre-K programs in the city’s school districts. One of the program’s perennial skeptics on the city council, Greg Brockhouse, would like to see the $35 million stretched to serve more kids, with less spent per child. The best way to do that, he has argued, is by using the funding to supplement existing programs in the public schools. He doubts that Pre-K 4 SA alumni will continue to stand out from their peers as they go through school; even if they do, their success will not be enough to convince him that the program is accomplishing its mission to improve educational outcomes for all San Antonio students. It will be October before Pre-K 4 SA can get individual data on all 750 of its first-year alumni but one of the eight partner districts, San Antonio ISD, is already using initial reading scores to compare its 51 Pre-K 4 SA graduates to their third-grade classmates. The district has a high rate of poverty: Over 90 percent of its students qualify for free or reduced-price lunch. In 2018, only 62 percent of district third graders passed the state reading tests, up from 55 percent in 2017. Of the Pre-K 4 SA alumni in San Antonio ISD, 67 percent passed, according to data provided by the district. A greater percentage of Pre-K 4 SA alumni also scored in the highest range. The same was true, though the margin was slightly smaller, when comparing the Pre-K 4 SA alumni only to their classmates who attended district pre-K.
Baray doesn’t like using standardized tests for children below third grade and won’t change the curriculum to groom students for test prep based on “the mistaken notion that if we get kids to mimic academic learning then they’ll excel.” She is also openly critical of elements of district pre-K programs when she talks to superintendents in partner districts. “I’m not going to tell you every single one of your classrooms is great,” she said. For instance, Baray has criticized districts for using Pre-K 4 SA grant funds to buy iPads and other “bells and whistles” with no proven impact. 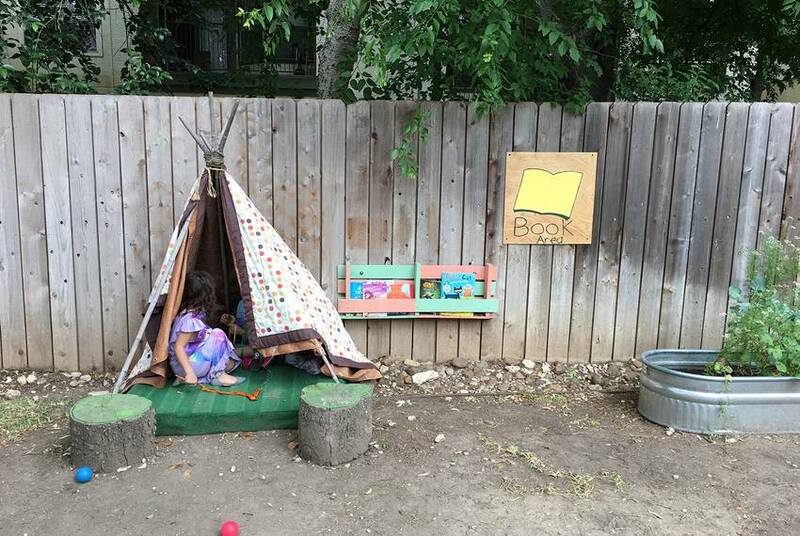 Pre-K 4 SA campuses themselves are very low tech. Those dreamscape-like playgrounds begin the school year almost completely empty. Over the months, teacher assistants, using reclaimed materials, work with the students to build all the components. This collaborative activity is far more valuable than any iPad program, Baray said. Baray stated she would rather see students work well together, express themselves appropriately and demonstrate good reasoning skills than learn to take tests or use an iPad. Those skills will stick with them, she said. Some teachers say they can see the lasting effect of Pre-K 4 SA on young graduates of the program as they enter the elementary grades. Christopher Flanagan-Gonzales, a third grade teacher at Mission Academy, said four of his students, who have been through the program, are more mature and interactive than most of their classmates. “They collaborate very well,” he said. Three of these students are reading at or above grade level, he added. The fourth, who came into the class significantly behind, still struggles with reading. Flanagan Gonzalez attributed the child’s difficulties to an especially unstable home life. Knowing that many students face such challenges during and after their time in Pre-K 4 SA, Baray is even more determined to give them a strong footing. The developmental delays associated with instability at home are one reason she stresses the need to have teachers who are highly trained in early childhood. Pre-K is the first chance many students get to recover lost ground. Another group of students also benefits from having highly trained pre-K teachers: According to the Education Law Center, an education advocacy group based in New Jersey, teachers with specific certification in early childhood are better able to serve students with disabilities. Pre-K teachers often work with parents who are discovering for the first time that their young children have learning issues. When she prepared to transition Cristóbal to kindergarten in San Antonio ISD, a team of Pre-K 4 SA teachers and administrators met with Ojeda to prepare her for what she would likely face. “They said, ‘You’re going to have to figure out a way to help him, and you’re going to have to figure out a way to advocate for him,’” Ojeda recalled. That’s exactly what she did. Kindergarten was a wake-up call, she said, and a constant struggle to get Cristóbal the same accommodations he had at Pre-K 4 SA. Without Pre-K 4 SA to look back on as an example of how happy her son could be at school, Ojeda said she might have given up. It took two more years, but she finally found a teacher and a principal within the San Antonio district who would commit to helping Cristóbal, she added. Cristóbal did not pass his state reading test this year, Ojeda said. Because of his learning issues, he reads at about a kindergarten level but that hasn’t changed her view of Pre-K 4 SA. “Reading scores only indicate how a child does on a test,” Ojeda said. Because of Pre-K 4 SA, “my son has the ability and desire to learn.” That’s what matters to her.